It was an action-packed hour. 1. Philip Levine: "It sure is fun to be the front runner!" Buoyed by a significant television advertising presence, The Miami Beach mayor has appeared near or at the top of gubernatorial polls for months. But Saturday night was the first time Levine faced sustained criticism from opponents in a debate setting. That fire produced one of the night's notable moments. After minutes of grilling from Andrew Gillum and Chris King about a $2,400 political donation to Marco Rubio and his attitude toward critics as the mayor of Miami Beach, Levine made a crack that the boisterous audience did not receive well. "It sure is fun to be the frontrunner!" Levine said to groans and even some boos. Graham and Gillum's campaigns have been waging a war via press release for months. (More on that here and here.) 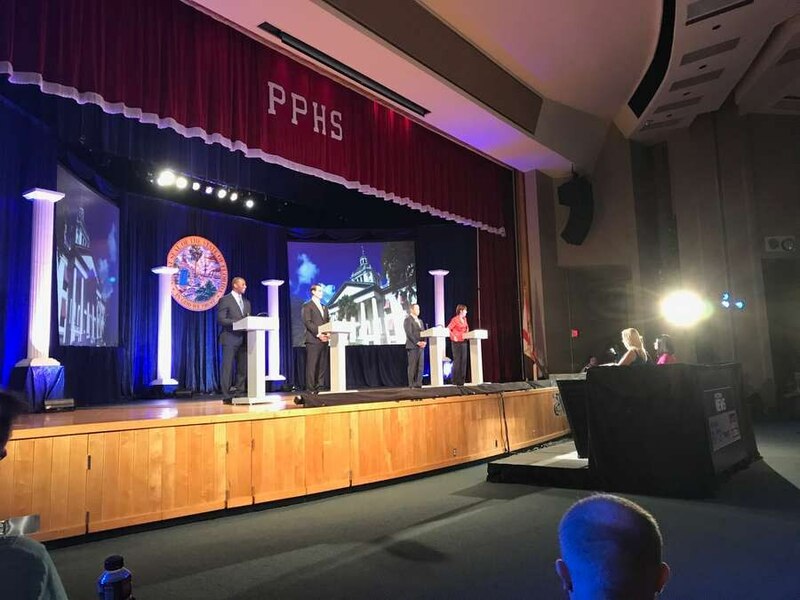 The Pinellas Park debate was the first time we got to see the two candidates engage in an extended back-and-forth in person. Graham defended herself, arguing that she's happy to talk about her Congressional votes. Then, despite earlier calls to her opponents to stop attacking one another, she went after Gillum's environmental record. "Mayor Gillum supported a $300 million coal power plant in north Florida. I never have thought that coal power was the way to go," Graham said, urging Gillum to explain his support for the project. Gillum said he ultimately opposed that plant, but the former congresswoman wasn't satisfied. "As my record has been one that we've discussed a lot, I would just have appreciated if Mayor Gillum had actually answered the question," Graham said. Gillum got a tough question from moderator and Tampa Bay Times political editor Adam Smith, who asked the Tallahassee mayor whether he has too much baggage to be a viable general election candidate. Gillum's city government is currently under FBI investigation, and although the mayor has yet to be directly implicated, he's faced some tough headlines of late. The recent bad press made it all the more surprising when Chris King, an Orlando businessman, defended Gillum. "I have gotten to know Andrew Gillum over the last year pretty well. I've probably spent more time with Andrew than my wife," King said to laughter. "And I can tell you, Andrew is a good and noble public servant." The typically well-prepared King was in attack mode all night, hitting Graham and Levine relentlessly. But when he was offered a chance to criticize one of Gillum's biggest weaknesses, he passed. 4. The candidates defended President Trump. Ok, this one is only sort of true. Smith asked the field about what they think President Trump has done right, drawing laughter from the crowd of liberal activists. It wasn't the most serious moment, but it was one of the few policy(ish) questions that prompted the candidates to offer substantially different answers. On education, almost without exception the candidates said they want more vocational training, higher teacher salaries and less reliance on testing. Medical marijuana? Implement it. Institutional racism? It needs to be combatted. But on what Trump has done right? Gillim: "When he takes a Twitter break." "He's a tragedy for our nation, and we're living through a nightmare."